Madagascar is known for its lemurs, the enchanting monkey-like creatures unique to the island nation. But one region in southern Madagascar has no lemurs left. In fact, there is very little wildlife to speak of. It’s a place where people can no longer find food. “All we’ve eaten for 4 years is red cactus fruit,” says Chief Voasaotsy, who lives in Anjampaly, a remote village in one of the worst-hit areas. He says it has not rained one drop there in all that time. 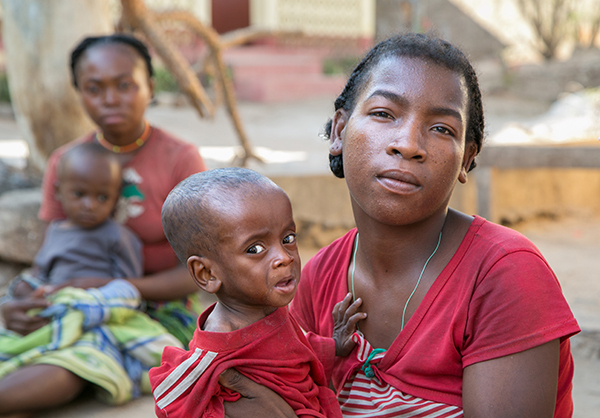 More than half of people don’t have enough to eat in the villages scattered across the sandy hinterland of Androy, Anosy and Atsimo-Andrefana, three southern regions in Madagascar. Five years of poor harvests mark what is now the country’s worst drought in 35 years, magnified by the effects of El Nino weather upheavals. 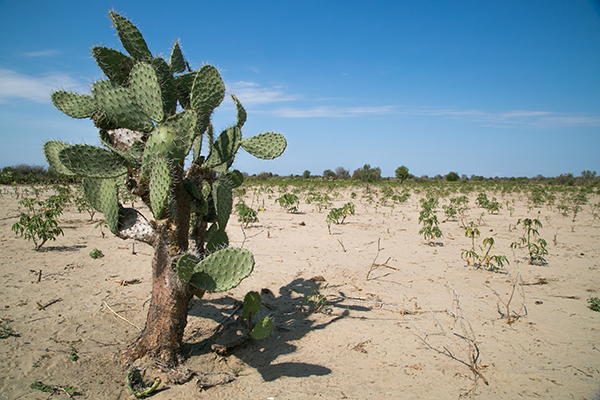 In a country where more than 90% of the population lives on less than $2 per day, drought is particularly dangerous. It has affected 1.4 million people, with about 850,000 needing immediate humanitarian assistance, according to the United Nations. Without help, the U.N. warns the situation could deteriorate into famine, with high rates of sickness and death among vulnerable groups, including pregnant women and young children, who rarely get enough to eat even when it does rain. Chief Voasaotsy says that everyone in his village was suffering, so when people started to die, it took them completely unawares. Amid so much hunger, it was hard to differentiate between who was hungry and who was on the brink of death. They brought drinking water and pots of beans and rice. In the village they discovered people were wasting away. When they measured children’s forearms to check for malnutrition, they found many were already in advanced stages. The sisters brought 11 extremely malnourished children to their clinic in Tsihombe, the next closest town, where they cared for them. Over the following months, the sisters cared for more than 100 children and their mothers, all of whom were suffering from acute malnutrition. “The bush taxis took pity on the hungry and brought them into town for free,” Sister Josiane says of the large public buses that navigate the South’s almost non-existent roads. To meet the demand for help, the sisters sought support from Catholic Relief Services. By March, they were working together in villages across the region. CRS worked with the U.S. government to shift aid funding for food from long term programing to emergency use, helping staff respond as quickly as possible in the most affected areas. Food is also being distributed by the sisters in a network of open-air cafeterias known as “village canteens.” Knowing that people have little access to water for cooking and had sold off their pots spoons to buy food, the sisters supply everything necessary for cooking and help prepare meals. Still, the need is overwhelming. 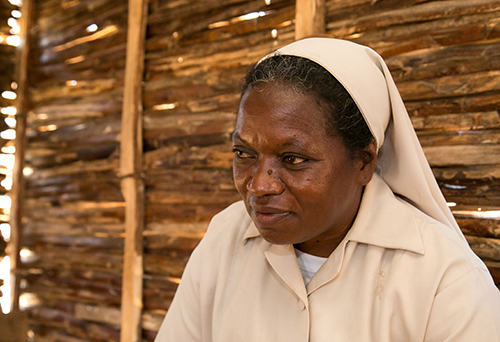 “We have to ration the food,” says Sister Josiane, explaining that there’s not enough for everyone. She said the village canteens have to be managed so they can be sure no one is left without some assistance. However, other villages are asking the sisters for aid, and they cannot support all of them. In addition to food, CRS is distributing seeds across southern Madagascar so farmers are ready for the planting season, which should begin now, although the rains are late. With funding from the United States, CRS is also organizing seed fairs, where farmers receive vouchers to choose from a variety of drought-resistant seeds. They would otherwise have no seed to plant, since successive failed harvests left no seed for future use. Funding from the European Union is allowing CRS to repair wells and encourage the planting of different vegetables to supplement staples like corn. The work includes introducing drought-hardy livestock and using dairy products in their diets or to sell for some income.